Five years after a 7.0 magnitude earthquake struck Haiti, the country’s journalists face threats, harassment, and silencing by government supporters and, on occasion, the president himself. While journalism had an urgent and imperative role in the aftermath of the earthquake, Haitian journalists have maintained a steady criticism of reconstruction efforts and, as a result, have been vilified by authorities. Ayiti Kale Je news team, with the assistant director in 2013. Pierre-Paul participated in a series of research interviews I have conducted with Haitian journalists since 2013 to highlight how Haiti’s media workers have covered the country’s reconstruction. As the 2015 anniversary of the earthquake approached, Haitian journalists clarified in follow-up interviews that celebrating reconstruction milestones was news of interest to external news agencies, mainly in the United States and for non-profit organizations operating in Haiti. Haitians remained concerned with events on the ground, specifically, the political impasse between President Martelly and opposition within the Haitian Senate. The political crisis had less to do with what Martelly’s government had or had not achieved with regards to reconstruction after the earthquake. Haitian news of the November to December 2014 protests, and January 2015 political crisis, had more to do with the government’s apparent failure to allow Haitians to participate in the democratic process, as Martelly’s administration had failed to organize local elections. Martelly’s administration had sought to establish legitimacy with the Haitian people by touting reconstruction projects. Yet the president’s government remained fledgling – one that Martelly had assembled in a disruptive earthquake year, with low voter turnout in a disputed election that was decided by external, international observers. Garcia’s AMIH, which was founded in opposition to the ANMH, joined forces with Pierre-Paul after the 2010 earthquake. Solidarity among Haitian news organizations after the earthquake reinforced the mission of Haitian journalism to advocate on behalf of the Haitian people who, as Haiti’s journalists argue, have been left off the bargaining table in a reconstruction directed by international players, such as the U.S.-led United Nations reconstruction effort in Haiti. It is why the recent political upheavals have dominated Haitian headlines and more importantly Haitian airwaves, the primary source of news and political mobilization in a country with low French literacy and a strong tradition of Haitian Creole radio broadcasting advocacy journalism. The re-unification of the ANMH and AMIH since the 2010 earthquake has been further bolstered by an alliance forged with Haiti’s leading alternative and community news media networks. Together, they , signed in 2011. However, as Kathie Klarreich, a Knight International Journalism Fellow, found in her work with Haitian journalists, the implementation of such ethical standards is often a challenge in Haiti. In interviews, Haitian journalists said that the economic constraints of rebuilding their homes and accumulating possessions after the earthquake remain a very real challenge. They have also mentioned their need to work multiple jobs and pointed out that many times, international donor and non-profit agencies pay triple their wages, presenting clear conflicts of interest. The owners of news organizations are aware of such challenges, and have sought to provide additional revenue streams for key journalists who cover the Haitian state or report on foreign organizations in an attempt to reduce conflicts of interest and preserve journalistic integrity. Haitian news organizations now face a strong competitor in non-governmental agencies who would like to hire journalists with talents, said Max Chauvet, the owner of Le Nouvelliste, Haiti’s oldest newspaper and current paper of record. Chauvet, who preceded Pierre-Paul as head of the ANMH, said the presence of hundreds of radio stations, in addition to the newspaper, now must compete for the same share of reduced advertising revenue to support their enterprise and pay their journalists. The millions of international aid that flows to non-governmental organizations mean that radio stations receive more advertisements from NGOs and that NGOs, in turn, seek out Haitian journalists as employees, Chauvet said. Haitian news organizations are outnumbered 10 to 1 by NGOs who seek to communicate their agenda across the airwaves, in print and in broadcast ads that read like news articles. “They have the means that we don’t have, so it is gonna be a tough fight. We can only influence the government,” Chauvet said. Taking an aggressive tone on coverage of the Haitian government has resulted in a range of retaliation. Haitian journalists indicated they experienced obstruction to information, reports, and interviews. They have been barred from access to press conferences or officials if they report news that has been critical of the Martelly administration or painted the government in a negative light. Journalists faced a common tactic, where official sources would take weeks or months to even return a call or request for information. Within the same time frame, a foreign journalist would receive an interview with the same Haitian official that a Haitian journalist had requested an interview with weeks before. Because such barriers to reporting supported facts, the early work of Ayiti Kale Je or Haiti’s Grassroots Watch allowed vital investigative reporting to filter through mainstream media in Haiti. Ayiti Kale Je emerged as a consortium of alternative and community news networks in August 2010, with collaboration from the faculty and students at the Faculté de Sciences Humaines, at the State University of Haiti. Co-founded by Jane Regan who taught at the university, the initiative produced more than 30 multimedia and multi-lingual investigative projects on the reconstruction with the goal of providing mainstream news organizations the material and jumpstart needed to critically cover the reconstruction. The Ayiti Kale Je project was unique, because it provided fact-based investigative journalism disseminated by the mainstream media. Non-profit donors also offered funding and Ayiti Kale Je journalists were given the financial support to practice investigative journalism without threatening the news organization’s bottom line. Max Chauvet, the owner of Le Nouvelliste, pointed out that reports by Ayiti Kale Je provided the entry point for Le Nouvelliste’s journalists to conduct follow-up reporting based on these findings. On some occasions, Le Nouvelliste published the Ayiti Kale Je reports in full, and key radio stations aired broadcast versions of the dossier reports. On each occasion, news media owners would be harassed by the government for doing so. Ayiti Kale Je journalists were ignored at media events by government officials and in one instance had their equipment damaged by administration workers and supporters. The Ayiti Kale Je project has since changed leadership. Regan, who no longer heads the project, said that unfortunately, no new investigative reports had been produced since January 2014. 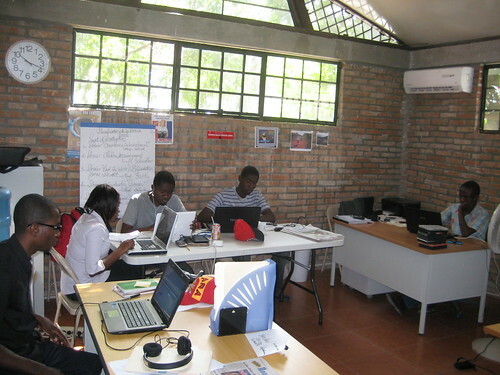 However, the Ayiti Kale Je project had accomplished a key objective within Haiti’s local journalism landscape, which was to provide fact-based reporting on Haiti’s reconstruction at a time when Haiti’s commercial media lacked the human and financial capital to conduct investigative journalism. While Le Nouvelliste has the largest staff of journalists, Chauvet pointed out, investigative reporting in Haiti requires the collective support of radio stations, the primary news source for the average Haitian. Radio provided the critical mass needed for Ayiti Kale Je reports to be disseminated in full or in part to the general public. And as Chauvet and Pierre-Paul said, when Haitian media owners act as a unit, they are able to protect press liberties from government retaliation and hold the government accountable. Both the ANMH and AMIH have jointly released statements on behalf of their membership to address state attempts to hike broadcast license fees for media organizations that air critical reports. Haitian media organizations have also condemned alleged threats on popular radio broadcasters who have either been insulted or denounced publicly by President Martelly, or have been the subject of alleged plots and death threats at the hands of Martelly supporters. Five years after the disaster, debates and interviews that take place on popular weekend news-talk radio programs now end up on the Senate floor. Although investigative reports are no longer being produced by the media consortium, Haitian media’s critical assessment of the state of the country’s recovery has been documented in editorials, commercial radio news, analytical news reports, and essays. Haitian journalists have stated in interviews that a lack of access to government data does not impede their ability to pose questions to officials in news reports. In some cases, journalists produce news reports that outline to readers in detail the degree of government obstruction encountered in providing answers to the public as the journalist attempted to cover an issue or event. “My role on the radio is to denounce corruption in government, to denounce the fact that the real reconstruction itself has not begun,” said Jean Monard Metellus, a Haitian veteran journalist and host of Ranmase, the most listened to radio program in Haiti, aired on Saturdays on Radio Caraïbes FM Haïti. Metellus reported in October 2013 that after a heated broadcast, he discovered that the nuts to the rear tires of his vehicle has been removed, nearly leading to a fatal accident. Other critics of the Martelly administration have found themselves in similar situations earlier in the year. Journalists have speculated that Martelly supporters are behind the spate of vehicle sabotage attacks. Such attacks have served to intimidate Haiti’s most prominent journalists, currently covering the Haitian state and the earthquake’s aftermath. Journalistic retaliation in the current context is far less violent and overt than it was under the Duvalier dictatorship. However, the current tactics employed by the Haitian state and its supporters have served to dissuade journalists from critical, advocacy, and investigative journalism that could change the current conditions of ordinary Haitians or the existing political status quo. Shearon Roberts, Ph.D., is an assistant professor of Mass Communication at Xavier University of Louisiana. She has covered news in Haiti, the Caribbean and Latin America as a journalist. In 2013 and 2014 she conducted extensive research in Haiti with Haitian journalists and media owners on the impact of the 2010 earthquake disaster on Haitian media and journalism. All interviews were conducted in French and translated for use in this article.